The fantastic frontline position and amazing views over the coastline to the open sea makes Villa Lobos an excellent holiday choice. Plus, the beach of Bahia Real is only a stone's throw away! The villa is spacious inside and out and is ideal for soaking up Canarian sunshine. Varied amenities in the centre of Corralejo, coupled with the stunning beach of Grandes Playas and famous dunes are all within a short drive. WiFi, air conditioning/heating in the bedrooms and pool heating are included. You can't get any closer to the coast, with stunning views from your own private pool! Unbeatable! The outside area is simply beautiful. Y ou can enjoy the fantastic sea views towards Lobos Island and Lanzarote in a distance. The private swimming pool has Roman steps for easy access and is surrounded with sun loungers . There is a brick BBQ, as well as a table and chairs on the shaded terrace - ideal for dining alfresco. The front door opens directly into the lounge/dining area. There is a private parking area through the large gates for your car should you choose to hire one. The open plan lounge/dining area has a comfortable sofa, a small coffee table, a flat screen TV and a table with chairs. There is a patio door leading out to the covered terrace. . A small archway leads to the fully equipped kitchen with all the modern appliances. There are 3 bedrooms in total in this villa. The double bedroom has an en suite bathroom and wonderful sea views from the patio doors, which open onto the covered terrace and pool area. The 2 twin bedrooms share a separate shower room. 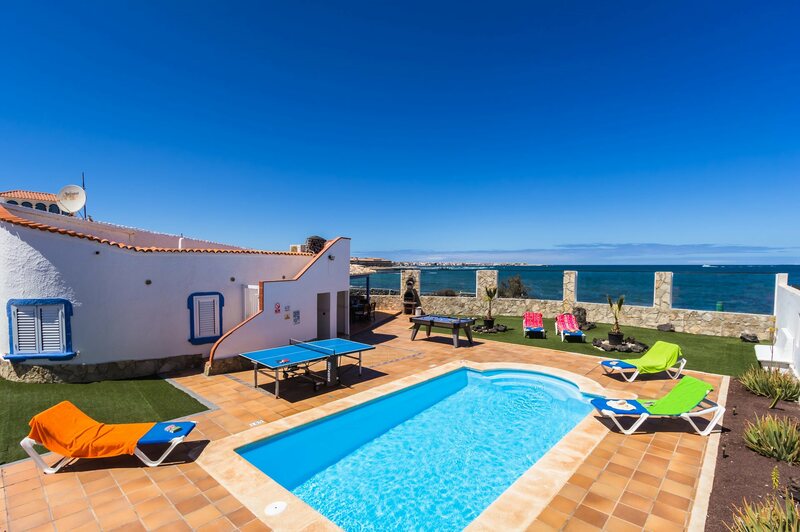 Villa Lobos is in a brilliant position on Corralejo seafront with breath-taking views over the water towards Lobos Island and Lanzarote. A short stroll along the seafront takes you to Bahia Real Beach. Within 30 minutes' walk or 5 minutes in a car and you are at Waikiki Beach. In this resort centre you'll find a fantastic selection of restaurants and shops. Our Villa Tamarindos is next door and Villa Talkayan is on the same street. For those who want a bit of retail therapy, there are a number of shops along Corralejo's promenade, as well as 2 large shopping centres - El Campanario and the chic Las Palmeras. There is a local market on Tuesdays and Fridays, great for bargains! Best to get there early as it gets very popular. There are restaurants 10 minutes away in the hotel Bahia Real that has 5 restaurants . What's more there are a number of bars and restaurants are in the centre of Corralejo. Approximately 40 minutes' leisurely walk along the seafront from the resort centre leads down to the harbour. Plenty of local bars, cafes and very good restaurants offer local produce and freshly caught fish here. The closest beach to the Villa Lobos is Bahia Real Beach. Approximately a 30 minute walk along the seafront or a short drive will take you the Waikiki Beach. The stunning Beach of Grandes Playas is also just a short drive away. The Acua Waterpark in Corralejo offers a variety of water slides and tubes or you may choose to venture in to the wave pool or the lazy river! You can even try your hand at crazy golf which is also located at the Acua Waterpark. There is another crazy golf course situated at the Plaza in Corralejo and there are 2 excellent courses at Caleta de Fuste, open to visitors and operated by the Barcelo Hotel. Fuerteventura's former capital, Betancuria lies in a picturesque valley next to a dried up stream, which flowed up until the 16th century. Here, The Centro Insular de Artesania, next to the museum, documents traditional arts and crafts. If you want to see some local handicraft this is the place to come! Make a visit to the Casa Santa Maria where you can watch local artists at work and even purchase some of the hand made products from the quaint local shop. El Cotillo is a small little fishing village and is the surfing and windsurfing Mecca of the island. If you fancy a game of golf, Mirador de Lobos Golf Resort in Corralejo is located close to the villa. Or for a larger course, there are other golf courses to be enjoyed in Caleta de Fuste located on the East Coast just after the airport. You can take a ferry to the neighbouring island of Lanzarote and discover volcanic mountains - perfect for a day out! Alternatively, you can try the go karting track in Puerto del Rosario. Smaller karts are also available for children. Hiking tours are arranged by the local council and full information can be found in the tourist office in Corralejo. Kites are available in many shops in Corralejo. The expansive sand dunes and golden beaches are perfect for kite flying. Villa Lobos is not available to book for season as it is sold out. Take a look here at the Fuerteventura villas that are currently on sale. Location is fabulous - garden is huge and facilities just right. Great place! The villa was spotless upon arrival, it was very well placed, a 15 minute walk to bars and restaurants everything you could possibly need in it, if you didn't want to go out. The views were amazing, would be great and safe for children to play in the garden or like us a lovely relaxing garden for sunbathing or dipping in the heated pool. Villa Plus was one of the most professional companies we have ever dealt with, from start to finish you felt that they were there for you, very important when you are in a different country in your own villa (not a hotel). Cannot praise Villa Plus enough, and would most definitely use them again, in fact we're already looking. The villa was very good and the pool very clean and warm. Villa was in a great location by the sea and was clean inside. Another great holiday with Villa Plus and will book again. We have been in Villa Lobos last year and this year for two weeks. It's a very nice house, a great place with a fantastic view. It all exceeded our expectations. The villa was so clean, it was just totally perfect I can't say enough about it. Just thank you so much for providing us with such an awesome holiday which we all were in desperate need of. Overall very good. Villa was very nice and we enjoyed staying there. The pool was great as it was bigger than usual and it had really great views. A little far out of town, but the payoff for that is it is near to the dunes and it is very quiet and private. Fantastic villa, excellent location, all mod cons and homely. Already booked to go back! This is our 5th villa plus holiday! Another one booked for October! Bob in the UK office is amazing and we have come to know him well - he and the staff are wonderful. As I am disabled my every need is accommodated. We love the villa and the location. Well done. Villa Plus, we recommend thou to all our friends! Villa was generally good with great garden and good views. Absolutely fantastic, better than the photos - thank you Villa Plus - holiday of a lifetime! We had an amazing holiday from start to finish. Can't think of anything to improve it, it was brilliant from start to finish and can't wait to book our next holiday with Villa Plus. We work in a social club and everyone asks us about our holidays, we have recommended Villa Plus to lots of people who all seem interested in using you so hopefully you will get some more bookings which you deserve. Thank you once again. Quite simply a brilliant experience overall. The villa and it's location was first class and the outdoor pool area was everything we had hoped it would be.